As time flows slowly by, Life's tide does rise and fall, Singing a baby's cry, Sighing a dead man's call. The lines above form the first stanza of a poem I wrote many long years ago. I no longer write poetry. But I still read and collect it. And this month, in honor of National Poetry Month, I will take you on a virtual tour of my Poetry Collection. I will present images of book covers and title pages of English and American poetry, and even a poem or two. Many of the books in my Poetry Collection stand side by side on a single shelf stretching across and above the closet in my library room proper. In the far right corner of this shelf, out of view of the camera, stand several poetry books that Alexander Smith writes about in his Dreamthorp essay, "A Shelf in My Book Case." I have all the other books he mentions in the essay as well. Smaller poetry books display their spines on the top shelf of an antique secretary bookcase in our living room, with the smallest ones stored in a slotted shelf inside the bookcase, hidden between the Americana Collection of Hershel V. Jones and Audubon's Birds of America. Still more poetry books are parts of other collections. My Hawaiian poetry books share shelf space in the wall unit in the family room with the other books of my wife's Hawaiiana and Danish Collections. Even our dog enjoys Hawaiian poetry. My wife and I would love to call Hawaii "our island home." But I need to win the lottery first. We were stationed there from 1977 to 1982 when I was in the Air Force, and have been back at least ten times. 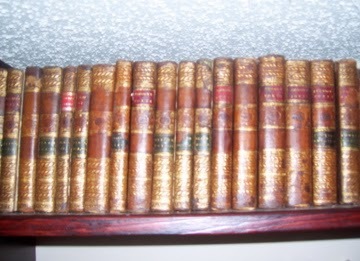 My volumes of The Works of the English Poets, With Prefaces Biographical and Critical by Samuel Johnson "top off" my Samuel Johnson Collection. My volumes contain the poems of Cowley, Milton, Rochester, Roscommon, Yalden, Otway, the Duke of Dorset, Halifax, Stepney, Walsh, Blackmore, Prior, Broome, Pitt, Somerville, Akenside, Moore, Cawthorn, Churchill, Lloyd, Cunningham, Goldsmith, Whitehead, Green, Armstrong, and Johnson. Johnson's Poets aren't the only poetry books I have from the late 1700s and early 1800s. I have one volume of Bell's Poets. And I have one volume of Cooke's Poets. And I have more than a handful of volumes of Sharpe's Poets – 26 volumes to be exact. These volumes, some of which I will rebind dos-à-dos, contain the poems of Addison, Tickell, Hamilton, Churchill, Cunningham, Cotton, Akenside, Gay, Swift, Prior, Butler, Savage, Dryden, Moore, Mallet, Langhorne, Green, Jago, Hammond, Lyttleton, Dyer, Thompson, Somerville, Shenstone, Young, Hughes, Congreve, Fenton, Blackmore, Pope, Glover, Goldsmith, Beattie, Johnson, Warton, and Jones. Nice engravings in the Sharpe edition! These are not frontispieces; they are located near the end of the section of each poet. Here's an 1811 edition of John Gay's works published by Suttaby, Evance & Fox. I was in the process of rebinding it when I noticed the filler material in the boards consisting of title pages of two books printed after 1811, meaning this book was rebound in 1819 or later. Here's a four-volume set of more British poets. 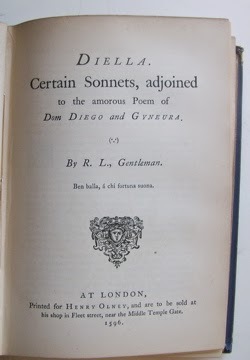 This set contains the poems of Milton, Cowper, Goldsmith, Thomson, Falconer, Akenside, Collins, Grey, Somervile, White, Burns,, Beattie, Gay, Shenstone, Butler, Byron, Pope, Mason, Watts, Hayley, Prior, More, Dryden, Smith, Bloomfield, Canning, Gifford, Lord Lyttleton, Hammond and Richardson. I love the frontispieces. Have you ever heard of The Penny Poets series from the 1890s? I have four volumes featuring two English poets, and two American poets. 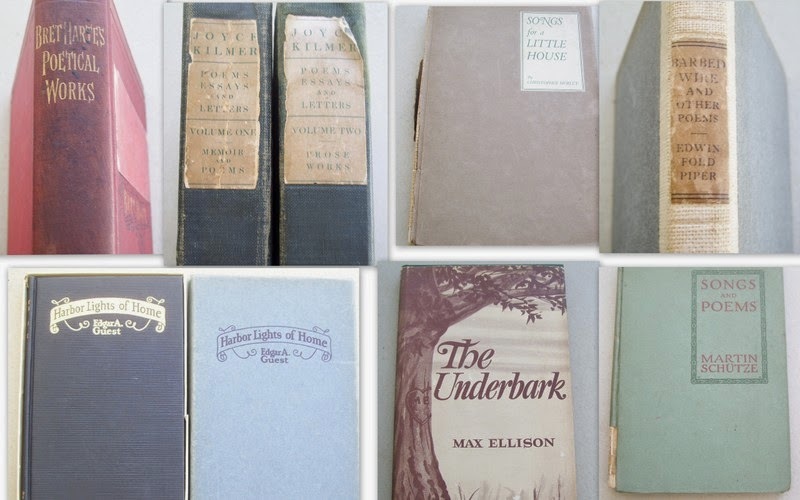 I have ten volumes of The Augustan Books of Modern Poetry (1920s and 30s). Austin Dobson (1840-1921) is one of the English poets whose works I collect. I have both English and American editions of some of his works. Now this oversized poetry book by Dobson had to find a place on top of one of the two bookcases in my library closet. By far, Henry Wadsworth Longfellow is the American poet who takes up the most shelf space in my library. 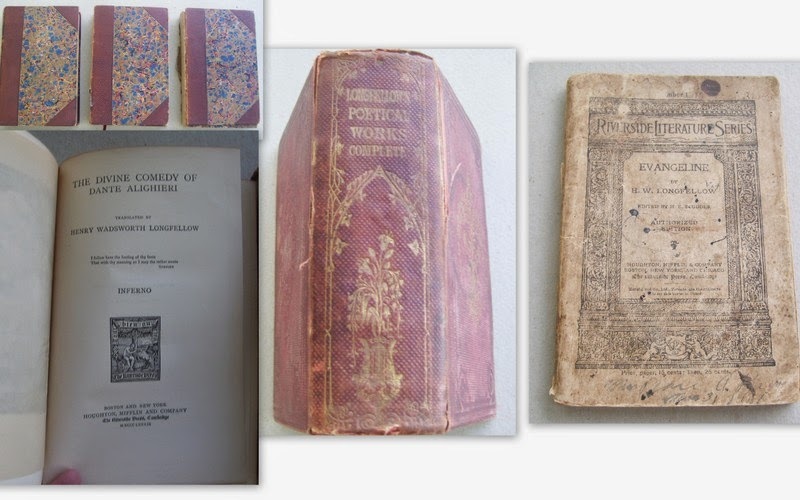 I have one complete set of the 45 parts of Longfellows poems and prose works issued from 1879 to 1883. And I have 43 parts of a second set. Subscribers had the opportunity to have the 45 parts bound into three volumes, but the former owner of my set, a Mrs. Barrett, chose to keep them as issued. On my bookbinding pile for years has been a three-volume set of Dante's Divine Comedy, translated by Longfellow and published in 1889. Next to it is an 1859 London edition of Longfellow's poetical works, followed by an 1896 Boston printing of Evangeline. The book that was the hardest ever to find was a book my sister-in-law remembered reading to her children when they were young. It was about angel children and the chores they perform each day of the week. But she couldn't remember the title. It took me six years to identify it. Frances Wosmek wrote and illustrated Sky High and it was first published in 1949. Frances, ninety-six years young, still writes poetry and has her own website: franceswosmek.com If you're familiar with her work, say hello to her. I have numerous poetry books of individual authors some of which I will display either covers or title pages, mostly in collages. Mark Samuels Lasner will be glad to see that I have Oscar Wilde's Poems in my library. Formerly owned by Henry E. Huntington's daughter Marian Huntington. If you want to read more poems from the 1500s, you'll find some in Edward Arber's English Garner. Here's a little trivia. The poet below, Edward Lowe, was the inventor of Kitty Litter. Since I call myself moibibliomaniac, I couldn't pass up a poetry book with "Moi" in the title, could I? The most beautiful book in my Poetry Collection is John Henry Nash's The Psalms of the Singer David. And yes, I do regard it as poetry. John Henry Nash gave this copy to the bibliophile Barton Currie in 1931. And here ends the virtual tour of my Poetry Collection. I hope you enjoyed it. If you want more, you can view the listings of all my poetry books on Library Thing. Great tour-- thanks for putting it up! Thank you Jerry....this is most beautiful and inspiring for all us Poets and Bibliophiles. Some very nice things there. Liked the Lalla Rookh and the Hawaiian books. Not only books.. everything about 'Books' pleases me. Thank you very much for the great day!